I’ve seen these courses from both sides. I took one before I started beekeeping and I’ve subsequently taught on them. Although I’m not convinced the seven topics above are the optimal way to cover the basics of beekeeping (perhaps that’s something for a future post? ), I am a strong supporter of the need to educate new beekeepers. However, beekeeping is essentially a practical subject and any responsible association will offer apiary-based training sessions once the season starts. A good association will run these throughout the season, enabling beginners to experience all aspects of the beekeeping year. If they don’t, they should (both run them and run them through the season). The reason is simple … ‘hands on’ with the bees is a much better way of appreciating some of the most important characteristics of the colony. It’s strength and temperament, the rate at which it’s developing, the levels of stores etc. But all this takes time. A couple of early-season apiary sessions might be held on cool evenings in failing light, or dodging Spring weekend showers. This means that ‘hive time’ is often restricted and beginners only get a small snapshot of the beekeeping season. Inevitably, many new beekeepers are desperate to get their own bees as soon as possible. After all, the season has started and there are kilograms of nectar out there waiting to be collected and converted into delicious honey for friends and family. 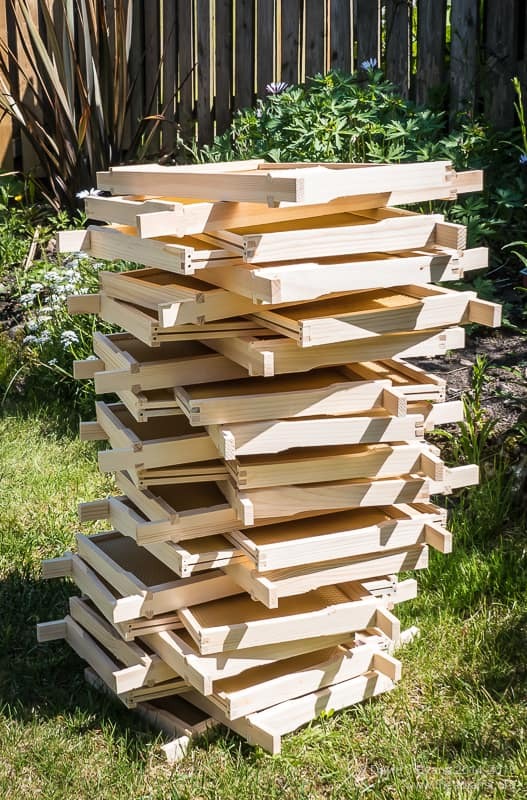 Demand for overwintered nucs is very high (usually significantly outstripping supply, meaning a considerable price premium) and a purchased colony, which should be strong and building up fast, becomes the property of someone who potentially has yet to see an open hive. The seasonal nature of the hobby and the way we train beginners creates a very steep learning curve for new beekeepers 1. Almost as soon as they’re out of the classroom (or draughty church hall) they’re faced with the start of their first swarm season. Their inevitable – and completely understandable – enthusiasm to start practical beekeeping reaches a crescendo at a time when they are singularly poorly equipped to manage the colony 2. The emphasis on the theory and practical aspects of beekeeping is understandable. There’s a lot to learn in a relatively short time. However, this focus on the practicalities often overlooks emphasising the responsibilities of beekeepers. In the frenetic early-season enthusiasm to ‘become a beekeeper’ these might seem unimportant, superfluous or entirely obvious. Later in the season the colony can become bad tempered, unmanageably large or ignored. Some or all of these happen with new (and not-so-new) beekeepers. The OSR goes over and colonies get stroppy, April’s 5-frame nuc “explodes” to occupy a towering double brood monstrosity or a new-found enthusiasm for dahlias or crown green bowls becomes all-consuming. Bees? What bees? Have you seen my dahlias? This is when the responsibilities of beekeepers become really important. What are the responsibilities of beekeepers? As I stated above, these might seem entirely obvious. However, every year new beekeepers start with the best of intentions but some have a near-total lack of awareness of what these responsibilities are (or mean). The combination of calm bees, careful handling and appropriate protective clothing means that bees essentially pose no risk to the beekeeper. However, strange as it may seem to a beekeeper, some people are terrified of bees (mellisophobics). Others, due to adverse allergic reactions (anaphylactic shock), may have their lives endangered by bee stings. Finally – and thankfully by far the largest group – are the remainder of the public who should never feel bothered or threatened by our bees, whether we consider this a rational response or not. The first point is sensible, whether or not there’s anyone else around. It makes beekeeping a much more relaxing and rewarding experience. The second point involves either keeping bees in unfrequented locations (infinitely preferable) or ensuring that bees are forced to fly up and away from the hives (by suitable screening) and well-away from passers-by. The final point is the most inconvenient, but also the most important. 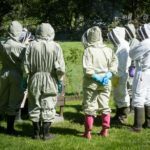 If there are members of the public around who might be bothered by your bees – walkers strolling across the field towards your apiary, kids playing in the garden next door – don’t open the hives. My apiaries have generally been in large rural gardens, private farmland and very well screened. I’ve also kept bees in urban environments, with no problems from the neighbours. However, I have always maintained out apiaries to move my bees to should they exhibit poor temper. Additionally, I’d only conduct inspections when the adjacent gardens were empty … meaning inspections were often carried out in sub-optimal weather or late in the evening. Finally, while many beekeepers consider the sight of a swarm is one of the truly great sights of beekeeping, this isn’t a sentiment shared by most non-beekeepers. Keep non-swarmy bees, clip the queen and keep a bait hive prepared to lure any swarms that do emerge. The first is straightforward. Don’t do things that negatively impact other beekeepers 4. For example, don’t plonk two dozen hives over the fence from an established apiary, unless you’ve first discussed it with the beekeeper and you’re both happy that the local forage is sufficient. And, of course, don’t steal hives or colonies 5. Disease is perhaps less obvious and more insidious. The health of your bees influences the health of other colonies in the area. Over short distances bees drift from one hive to another. Over much longer distances strong colonies can rob weaker colonies. All these bee exchanges also move the parasites and diseases they carry between hives. This includes Varroa, Nosema, a panoply of pathogenic viruses and European and American foulbrood. Of these, the foulbroods are statutory notifiable diseases and beekeepers are legally required to report suspected diseased colonies under the Bee Diseases and Pests Control Order 2006 (and amendments). Responsible beekeepers will register their apiaries on the National Bee Unit’s Beebase so they are notified of local outbreaks, and so the bee inspectors can check their colonies if there is a nearby outbreak. Whilst not notifiable, the remaining parasites and pathogens are also best avoided … and certainly should not be foisted upon other local beekeepers. If your colony is weak, disease-riddled and poorly managed it may get robbed-out by other local strong colonies. In doing so, your bees will transfer (some of) the pathogen load to the stronger colony. US beekeepers use the term ‘mite bomb’ to refer to an unmanaged, Varroa-riddled, collapsing colony that introduces significantly higher mite levels to local strong colonies as it’s robbed. This is more extreme, but not dissimilar, to beekeepers that treat with miticides far too late in the season. Their colonies retain high mite levels and can spread them to nearby hives. One way to avoid this is to coordinately treat mites in the same geographic area. Bees may or may not be classified as livestock. The standard definition 6 of “domestic animals kept on a farm for use or profit; esp. cattle, sheep, and pigs” is perhaps a little restrictive 7 so lets accept for the moment that they are livestock. If you keep livestock you usually need to register them and vaccinate them, and you always need to look after their health, feed and transport them properly and generally take responsibility for them. If you don’t look after their welfare you may be prosecuted. Of course, bees are invertebrates, not mammals or animals with backbones. Legally invertebrates are not usually considered as animals in the Animal Welfare Act 2006 8 which defines the law on animal welfare. But all these definitions are a distraction. In my view, if you keep bees you have a responsibility to look after them properly. Even if this isn’t a legal requirement, its a moral responsibility. This responsibility to your bees includes – but is not restricted to – preventing and treating them for disease when appropriate and ensuring they have sufficient stores going into winter (and during periods with no nectar). If you can’t do this perhaps take up crown green bowls instead. Blimey, this is all getting a bit heavy isn’t it? Bees are not ‘fit and forget’. Actually, they’re quite the opposite. Proper management means that there are certain things that must be done at a particular time. This includes treating for mites at the end of the summer honey season, feeding the colony up for winter and swarm prevention and control. If you work abroad for April and May or if you holiday on the Maldives for six weeks every autumn you’re unlikely to become a successful beekeeper. And you’re certainly unlikely to be a responsible beekeeper. What prompted this post? A combination of things … cabin fever and online discussion forum posts from beekeepers puzzling why their colonies all died (no mite treatment, ever) or starved (no feeding before winter) or hadn’t been inspected in the last 15 months (“I’ve been busy”). This entry was posted in Diseases, Feeding, Imports, Responsibility, Varroa and tagged animal welfare, Crichton honey, livestock, moral responsibility, Parkfield Labour Club on January 4, 2019 by David. As I write this we’re approaching midsummer of one of the best years beekeeping I’ve had in a decade. In Fife we’ve had excellent weather, and consequently excellent nectar flows, for weeks. Queen mating has been very dependable. I’ve run out of supers twice and have been building frames like a man possessed. In a few short weeks it will be all over. The season won’t have ended, but this non-stop cycle of inspections, adding supers, building frames, splitting colonies, making up nucs, taking off laden supers, extracting and more inspections will be largely finished. Literally, as it’s been yielding really well recently. I’ve written previously about The Goldilocks principle – not too much, not too little – and bees. As an individuals’ competence improves over successive seasons, colony numbers can quickly change from too few to too many. A single production 2 colony in a good year should probably also be able to generate a nuc for overwintering and possibly a new queen for re-queening without significantly compromising honey production. That’s certainly been the case this year. I’ve got a few colonies that produced nucs in May, were requeened (through vertical splits) in late June or early July and that have produced several supers of honey, either from spring or summer flows. I said in the opening paragraph it’s an exceptional year. The ability to produce a surfeit of both bees and honey requires some skill, some luck and some good timing. In a bad year, just getting one of the three – a new nuc, a new queen or a honey surplus – from a colony should be regarded as a major success. How do you cope with problems encountered in these bad years? I’m a strong supporter of self-sufficiency in beekeeping. Although I’m not fundamentally opposed to purchasing queens or nucs, I do have concerns about importation of new virus strains and other ‘exotics’ that do or will threaten our beekeeping. However, buying in high quality bees for stock improvement is understandable, expensive at times and the foundation of at least some commercial (and amateur, but commercially viable) beekeeping. What I’m far less keen on is purchasing bees – a significant proportion of which are imported – to compensate for lazy, slapdash or negligent beekeeping. I knocked off all the queen cells to stop them swarming in June and July. They just might be queenless. I know it’s early October but do you have a mated queen spare? I’ve heard variants of all the above in the last few months. This stop-start beekeeping is not really beekeeping. I’ve discussed this in Principles and Practice extensively. I’ve called them beehadders before but perhaps the term ‘serial ex-beekeeper’ might be more accurate. The reality is that, with a little skill, a little luck and just reasonable timing you can have bees in perpetuity … the real topic of this post. In perpetuity meaning you are self-sufficient for stock and for spares. You’re able to exploit the good years and survive the bad. You only need to buy in bees for stock improvement or to increase genetic diversity (which may be the same thing). Once you’ve got bees, you’ve always got bees. It’s a good position to be in. It gives you security to survive accidents, self-inflicted snafu’s and even the odd fubar 3. You are no longer dependent upon the importer, the supplier or your mate in the local association to bail you out. It gives you confidence to try new things. It means you can cope with vagaries in the weather, forage availability or simple bad luck. How is this nirvana-like state of beekeeping self-sufficiency achieved? I think it can be distilled to just two things – one is easy, the other slightly more challenging. Firstly, you need to maintain a minimum of two hives. Secondly, you need to develop an appreciation of how the colony develops and understand when interventions and manipulations are most likely to be successful. I’ve discussed the importance of a second hive previously. With one hive, beekeeping errors (or just plain bad luck) that result in a queenless, broodless and eggless colony might well be a catastrophe. With two hives, you can simply take a frame of eggs from the second colony and voila, they’ll raise a new queen and your imminent categorisation as an ex-beekeeper is postponed. The benefits of two colonies far outweigh the expense of the additional equipment and time taken to manage them. In a good year you’ll get twice as much honey to impress your friends and neighbours at Christmas, or to sell in the village fete. 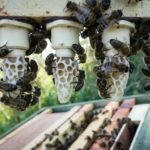 In a bad year, the ability to unite a weak colony headed by a failing queen in late September, might mean the difference between being a beekeeper and being an ex-beekeeper the following Spring. Maintaining two colonies in the same apiary significantly increases your chances of having bees in perpetuity. Beekeeping isn’t really very difficult. You provide the colony with somewhere to live. 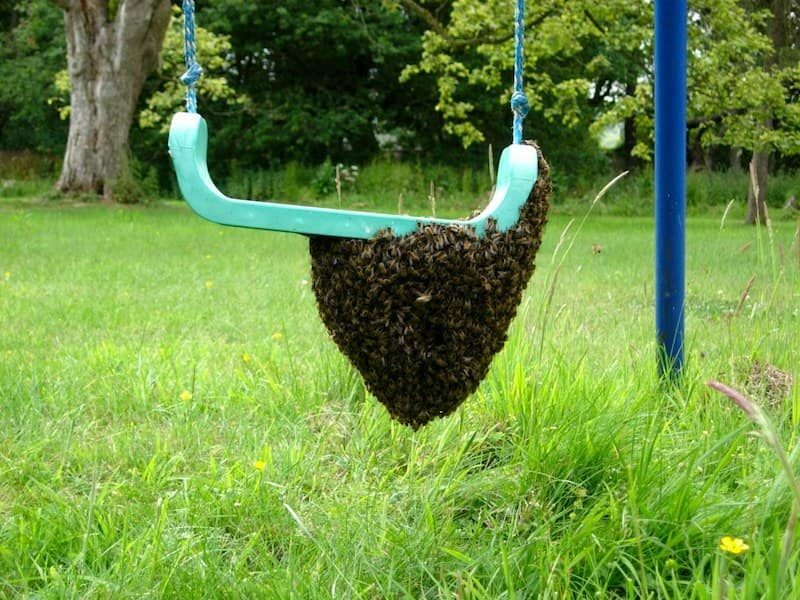 You give them sufficient extra space to dissuade them from swarming (swarm prevention), or intervene in a timely manner to stop them swarming (swarm control). If you harvest some or all of the honey you provide them with more than they need of an alternative source of sugar(s) at the right time. Finally, you monitor and control the pathogens that afflict them and apply appropriate treatments, at the right time, to minimise their impact. As you can see, timing is important. Do things at the right time and they work … at the wrong time they don’t. Timing is also important in terms of the frequency of inspections (which I’ve briefly discussed before, so won’t repeat here), and in the manipulations of the colony. These colony manipulations include – but aren’t restricted to – providing them space to expand, spreading the brood nest, making nucs, rearing queens or at least getting queens mated, adding supers, uniting weak colonies and feeding them up for the winter. Again, if you do the manipulations at the right time they will probably work. Hence the ‘art of the probable’. For many of these manipulations, the ‘right time’ essentially depends upon the development of the colony and weather. And, of course, colony development is itself very much influenced by the weather. Consider queen mating. Of the various manipulations listed above, this is one upon which the future viability of the colony is absolutely dependent. Queen mating usually occurs mid-afternoon during dry, preferably sunny weather, on days with relatively light winds and temperatures of at least 18°C. Therefore if there’s a mature virgin queen in your hive 5, the weather is suitable and there are drones flying, she’ll probably get mated. Days like this occur pretty dependably in late May and June. It’s no coincidence that this is the peak swarming season. Conversely, if through carelessness or neglect your colony goes queenless in late September, the probability of getting a warm, dry, calm afternoon are much less. It’s therefore less probable (and potentially highly improbable) that the new queen will get mated. That’s not to say it won’t happen … it might, but it is less probable 6. In re-reading this post I feel as though I’ve skirted around the core of the issue, without satisfactorily tackling it. Having bees in perpetuity is readily achievable if you have a backup hive and you understand how colony development and the weather determines what you can and cannot do to the colony during the season 7. Having two hives but inadvertently damaging both queens in March during heavy-handed inspections will not provide bees in perpetuity. Conversely, irrespective of your best efforts, a single terminally broodless and queenless colony at the peak of the swarming season cannot magically create a new queen … meaning you’re about to become an ex-beekeeper. I’ve used queen mating as an example because it’s a binary event … she’s mated successfully or she’s not, and colony survival absolutely depends upon it. However, the timing of many of the other manipulations can also influence the strength, health and robustness of the colony. Providing too much space in cold weather delays expansion as there are too few bees to keep the brood warm. Trying to feed syrup very late in the season may mean it’s too cold for them to access the feeder, leading to starvation. Finally, using the wrong miticide at the wrong time is a guaranteed way to ensure more mites survive to damage the colony in the future. Learn to do the right thing at the right time … to both your colonies. The recipe to having bees in perpetuity. In (for or to) perpetuity means “for all time, for ever; for an unlimited or indefinitely long period” and has origins in Latin and French with English usage dating back to the early 15th Century. ‘Unlimited or indefinitely long’ could also refer to the length of this post or the delay to my flight last Sunday. You can thank EasyJet for providing me with more than ample time to write this magnum opus. This entry was posted in Beekeeping, Imports, Queen failure, Responsibility, Training and tagged compensation, EasyJet, Nirvana, Smells Like Teen Spirit, Stelios on July 20, 2018 by David. I believe that the importation of bees is detrimental to the quality of beekeeping in the UK. I think the beekeeping associations – national and local – should do more to discourage imports, that they should strongly encourage rearing local bees, and that they should have more emphasis on promoting the practical skills necessary for sustainable beekeeping in the UK. This post was going to be called something like “Benefits of a ban” but I think the present title better reflects the problems in UK beekeeping and my views that readily available imported bees actually reduces the standard of beekeeping in the UK. The ban mentioned in the provisional title refers of course to a (potential at the time of writing) ban on the importation of bees and queens due to the recent discovery of Small Hive Beetle (SHB) in southern Italy. Will there be a ban on imports and is this post relevant if there is no ban? The European Union allows free trade between member states. However, it might be possible to impose a ban temporarily under Article 36 of the Lisbon Treaty which allows import restrictions for “the protection of health and life of humans, animals or plants”. However, whether there is a ban imposed to prevent SHB entering the country or not, I believe that the importation of bees is detrimental to the standard of beekeeping in the UK. Thousands of queens and packages of bees are imported into the UK annually to meet the demands of; i) newly trained beekeepers, ii) beekeepers who lose stocks overwinter, or iii) beekeepers wanting to increase of improve their stocks. Our temperate climate provides a five month window for queen rearing. This creates a supply and demand problem, with maximum demand at a time when supply is limited. Cheap imported bees and queens act as a disincentive to rebalance this supply and demand. If imports were not available we would have to become better beekeepers, raising more nucs for overwintering, managing and meeting expectations for newly trained beekeepers, improving colony health and hence overwintering success and raising many more quality locally bred queens. Conversely, if the supply and quality of local bees and queens was better in the UK there would be fewer imports needed. We are in a Catch22 situation. 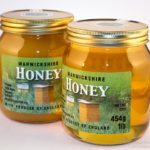 Sustainable UK beekeeping (i.e. beekeeping that is no longer reliant on imports) does not mean reductions in numbers of colonies or numbers of beekeepers. Instead it requires, and would result in, an improvement in practical beekeeping skills. That’s it in a nutshell … however, if you want the unabridged version, read on. I would support a ban on the importation of bees and queens … not only from Italy, but from other countries as well. My primary reason in supporting such a ban is to restrict the chance that Small Hive Beetle (SHB) will arrive here. I fully appreciate that there are some commercial beekeeping operations that would likely be decimated by such a ban. In particular, it would destroy the business model of the commercial suppliers of early season queens and nucleus colonies (nucs). This is clearly undesirable on an individual basis and I regret the impact a ban would have on the livelihood of the individuals concerned. However, I consider this business model exploits underlying weaknesses in UK beekeeping and a ban would have long-term benefits in the creation of better beekeepers practising a more sustainable type of beekeeping in the UK. My support for a ban is not to increase the number of queens I sell each season. My queen rearing is very much a hobby-sized activity, limited by my full-time employment, unpredictable deadlines and regular absences on the conference circuit. In many seasons – 2014 being a case in point – I barely generated enough queens for my own use. I would gain nothing from a ban on imports. In contrast, I think UK beekeepers and beekeeping have a lot to gain from becoming more self-sufficient. Thousands of queens raised overseas are imported to the UK every year. In 2014 alone nearly 10,000 queens were imported from Slovenia, Greece, Italy, Denmark and Cyprus (only listing the countries from which >1000 queens were imported). In addition a further 580 nucs and 1402 ‘packages’ were imported. I’m assuming that the National Bee Unit (NBU) defines a package in the same way they do in the USA – a mesh-sided shipping box containing 1-2kg of bees and a caged queen. 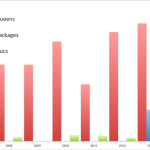 2014 saw the greatest number of imports of the last 8 years and there has been a steady increase since 2007, with queen imports only numbering less than 5000 in 2011. Why is demand so high? Beekeeping has seen a recent rise in popularity, with hundreds of new beekeepers being trained every year in associations across the country. Many courses recruit 30-50 trainees each winter. 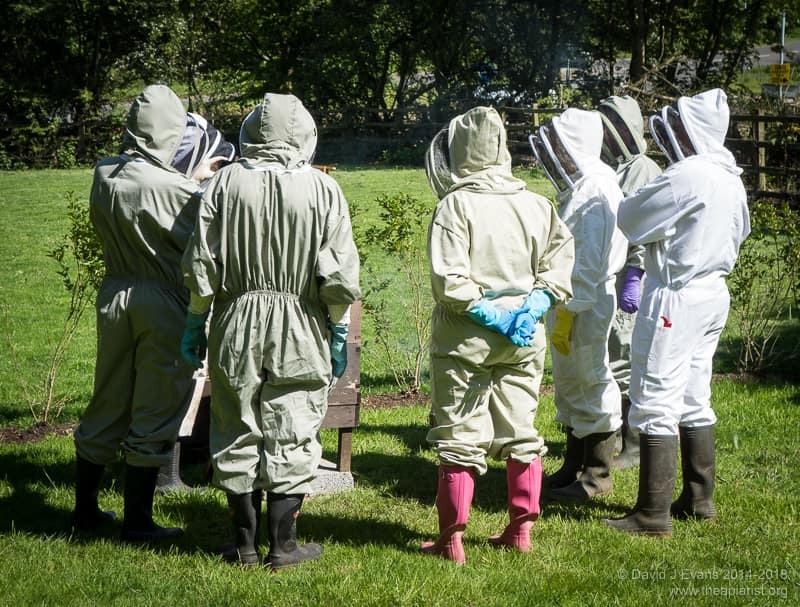 Not all these fledgling beekeepers will end up getting their own bees – some accompany partners, some discover they’re allergic to stings and some are horrified the first time they’re suited up and standing next to an open hive – however, many of them do. Inevitably this generates a large demand for nucs early in the season to satisfy the enthusiasm of these new trainees. I was no different … I completed a course between January and March and then waited impatiently for a nuc to be ready. 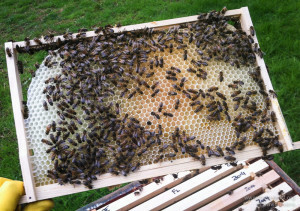 I bought a 5 frame nuc headed by an imported queen from an association member and started my beekeeping in mid-May. Demand for imports is likely to be generated by new trainees, compounded by the recent increase in the popularity of beekeeping and the timing of ‘Begin Beekeeping’ courses. 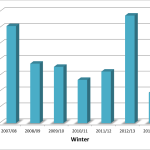 Over the last 7 years overwintering colony losses in England have averaged about 20% with – unsurprisingly – the greatest losses during the hardest/longest winter (2012/13). Inevitably some beekeepers, particularly those who are inexperienced or who have only one hive, might lose all their colonies. The most significant cause of overwintering colony loss is high levels of the parasitic mite Varroa and the consequent high level of pathogenic viruses such as Deformed Wing Virus. Understandably, enthusiastic beekeepers want to replace their overwintering losses, again driving up demand for bees early in the season. I think there are additional potential causes of demand, though these are perhaps spread throughout the season. These are beekeepers a) wanting to increase their stocks or b) improve their stocks by replacement of an existing queen with a particular strain chosen for perceived docility, honey yield or a number of other reasons. 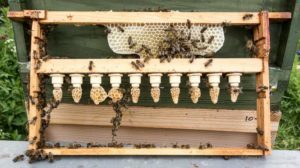 There may also be additional demand to replace failing queens – drone layers for example – often identified when the colony is first opened in spring. Enthusiastic newcomers to beekeeping (perhaps entering their second year) as well as beekeepers who have had bees for many years probably contribute to this demand for imported bees and queens to increase or improve stocks. In addition to the demand from ‘amateur’ beekeepers there is additional demand from some bee farmers, by which I mean individuals who make some or all of their living from honey production and pollination services (rather than individuals who import bees for resale). For example, £200,000 was provided by the Scottish government to import package bees after the 2012/13 winter. I know some bee farmers are entirely self-sufficient, raising queens and nucs to make increase, to replace their own losses and to sell if there is excess. However, with the exception of the large number of packages imported to Scotland over the last two years I have no idea how many bee farmers are reliant on imports. Since hobby beekeepers far outnumber bee farmers I will restrict the majority of my comments to this sector – a group that presumably also includes all newcomers to beekeeping. Where do bees come from? In the absence of imports the demand for new queens, nucs and colonies would have to be met by taking advantage of the natural ways that bees reproduce i.e. by splitting strong colonies that are at risk of swarming, by capturing swarms that escape and by forcing the bees to raise one or more new queens by making a colony queenless (or at least think it’s queenless). Since splitting colonies reduces the foraging workforce it may impact on the amount of honey generated; in a normal season a beekeeper generally must choose between making new bees or making honey from any one colony. The rate limiting step in making new bees is the provision of newly mated queens. This generally requires warm, settled weather and fertile drones. In this area (the Midlands) we sometimes have suitable weather in April, but rarely have mature drones until May. In contrast, it’s not unusual to have both drones and good weather in September. Therefore home-grown bees – whether mated queens, nucs (and possibly swarms) – should be readily available in the five months May to September. 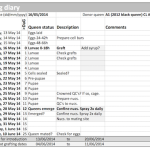 Inevitably these dates cannot be precise – it’s good to let a newly mated queen demonstrate a good laying pattern which takes 7-14 days after she first gets going. Over the last five years the earliest and latest dates I’ve had queens mated on was about the 22nd of April and September respectively. Mid- to late May or early June is probably 4-6 weeks too late for the peak demand for new queens and nucs. It’s during this critical early season period that overwintering losses and failed queens are detected, it’s the time when keen new beginners want their first bees and when the more experienced want to increase their colony numbers to exploit on the summer flows. The supply of locally-raised bees is currently unlikely to meet this early season demand due to weather restrictions on queen mating. How can we better match supply and demand? Or, more importantly, how do we match supply and demand without resorting to imported bees and queens every year? This is unlikely to be solved overnight, but there are several very obvious solutions that would help both meet the demand and improve local beekeeping. Bees for beginners. 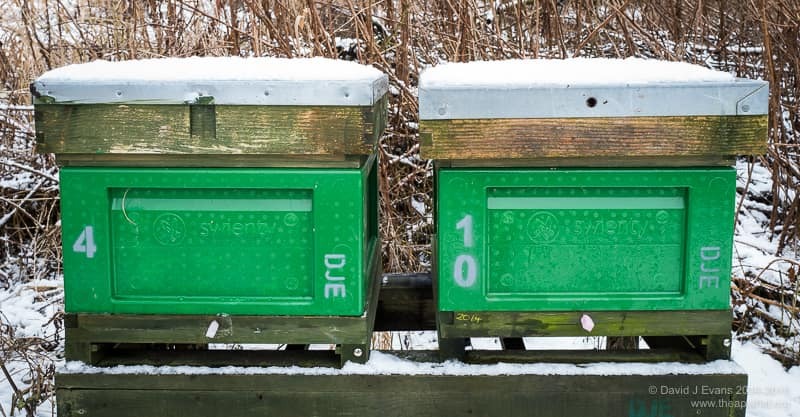 One obvious solution would be for associations to only train as many beekeepers as they can realistically provide overwintered nucs for the following spring. This would have a number of immediate benefits. It would generate revenue for the association members who provided the nucs. The revenue might also be shared with the association who trained the new beekeeper – they after all ‘created’ the buyer – potentially offsetting the financial losses of a reduction in the total numbers taking the training course. Furthermore, as established members recognise the annual demand from new trainees and invest in the equipment and skills needed to provide the nucs, increased numbers of beginners could again be accommodated on winter training courses. Since the nuc would be provided from locally-raised bees, they should be from a trusted and disease-free source, suited to local conditions and they could be inspected before purchase. If the nuc was overwintered the queen would presumably be well-established and her quality would be obvious. If the nuc was generated early in the same season the beginner would have to wait a little longer, but could be mentored during this period, even working alongside the experienced beekeeper to generate the nuc and monitor its development. Mentoring of beginners and their nucs (and in due course colonies) should then be extended throughout the first season to include the important preparation for overwintering, which takes us to the second cause of high early season demand for new queens and nucs. Bees to replace overwintering losses. Some losses are perhaps inevitable. However, they can certainly be minimised by good preparation for the winter. This starts as early as midsummer by careful attention to the following points; queen vigour, colony health, stores and the hive. Taking these in the reverse order, it goes without saying that the hive should be watertight, secure and protected against damage (for example, from grazing stock or woodpeckers). There should be sufficient stores present in the hive, either from syrup or fondant fed early enough and generously enough for the brood box to be stuffed at the beginning of winter. Knowing when to start feeding requires experience – too soon and you’re needlessly increasing your expenditure (the bees will still be foraging), too late and the colony may not lay down enough stores and so starve overwinter. During the winter it is also essential to ensure that the stores are not exhausted, by regularly ‘hefting’ the hive and providing fondant as required. It’s critical that the health of the colony is good going into the winter. This primarily means monitoring the Varroa mite numbers regularly during the season, minimising the mite load in August/September – to help raise a generation of bees for overwintering with low viral loads – and treating again in mid-winter during the broodless period to further reduce mite numbers. Weak colonies in mid/late summer are unlikely to overwinter well – there’s little point in mollycoddling them and (assuming they are healthy) it is almost always better to cull the queen and unite them with a stronger colony instead. The stronger colony will benefit and the weak colony, even if it did survive, would have been slow to develop in the spring. Finally, young vigorous queens generally lay later into the autumn, overwinter better and lay earlier and more strongly the following spring. Therefore it makes sense to replace ageing queens in the summer, rather than risk losing the colony due to her failing in the winter. This doesn’t necessarily mean culling her … she could be moved to head a nuc for overwintering for example, keeping a desirable line going for queen rearing the following season. Ted Hooper (in Guide to Bees and Honey) was a strong advocate of the benefits of young queens for overwintering success, recommending requeening in early September. Making increase. 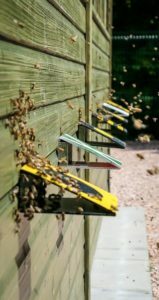 With a little planning and preparation it is possible to exploit the natural tendency of strong colonies to swarm in April-June to make increase. Although this might reduce honey yield it works with the bees to increase colony numbers. 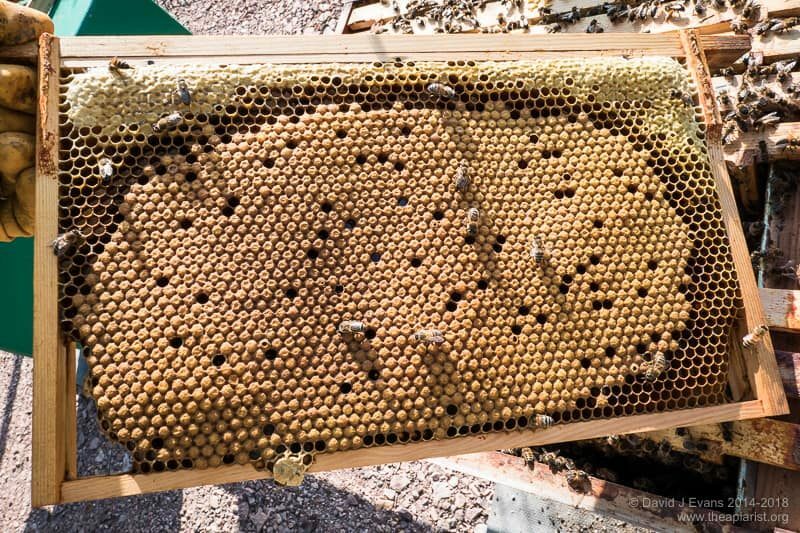 With experience, it’s usually possible to split a well-timed nuc from a strong colony without significantly impacting nectar gathering, with the nuc likely to build up to a full colony for overwintering. In addition, any area with reasonable numbers of beekeepers (and just look on BeeBase to see how saturated your local area is … there are 207 apiaries within 10km of my main out apiary) is likely to yield a number of swarms that will need collecting or can be caught in bait hives. If you divide colonies about to swarm or collect/attract swarms you might end up with swarmy bees, and you have no control of the quality of bees you acquire. However, queen rearing is not difficult and it is easy to requeen swarmy colonies or swarms of dubious quality … which takes us neatly on to improvement of stock. Stock improvement. Why is an open-mated queen purchased in early May for £40 and flown 1600 miles from Southern Italy likely to be better quality than a locally-bred queen from an association member or group who have been rearing queens in the area for several years, culling their poorest stocks and breeding from their best? Which queen is more likely to raise brood that suits the local environment? Which queen is likely to head a colony with the correct balance of stores and bees to overwinter best? Which queen is more likely, in due course, to yield daughter queens that better suit your local environment, that are placid and exhibit other desirable traits? I have no doubt that a locally raised quality queen would usually be better than an imported queen. However, not all locally raised queens are of good enough quality. This takes us onto the benefits to UK beekeepers of practising sustainable beekeeping. If an imported queen cost £500 and package was double that there would be a healthy market for local bees and queens. It would be too expensive to rely on imports to make up for overwintering losses. Beginners would happily wait a week or two or three extra for a locally-raised nuc. What if they were even more expensive than that? What if they were priced beyond the reach of any beekeepers? Or what if imports of any bees were banned entirely? If this were the case there would be real pressure for UK beekeepers to generate sufficient numbers of good quality nucs and queens to meet demands throughout the season. This would involve more beekeepers overwintering nucs to make up losses, to make increase or to sell on in the spring. It would result in more beekeepers learning some of the easy methods of queen rearing (not those involving grafting, mini-nucs or instrumental insemination), so they could become self-sufficient, and would encourage individuals or groups to undertake active stock improvement to raise much better quality queens. Nucs are more difficult to overwinter than full colonies. But not much more difficult. They have limited space for stores and the winter cluster is smaller. However, high quality poly nucs are now available from a number of suppliers and provide much better insulation to the colony, reducing the rate at which stores are consumed and increasing overwintering success rates. With UK-raised overwintered nucs costing up to £195 in recent years from reputable commercial suppliers the cost of the actual nuc would very soon be recouped even if sold on within the association at a more reasonable cost. If more beekeepers learned how relatively easy it was to prepare and successfully overwinter a couple of nucs it would go some way to meeting the early season demand for bees. Most swarm control methods can be readily modified to split a colony, with the queenless ‘half’ raising a new queen in due course. All it requires is a minimum of additional equipment, an appreciation of the timing of the egg-larvae-pupae cycle and the necessary weather and drones for successful queen mating. It also requires reasonable quality bees to avoid propagating unpleasant stock. There’s no point in generating bees that run frantically over the frames, that have a lousy brood pattern, that are aggressive or – my least favourite trait – that follow for hundreds of yards. Any of these take the pleasure out of beekeeping, if combined they are a nightmare (but certainly not unknown). This requires that individuals improve their record keeping, they should improve how they judge their colonies and should then select from their best stock to raise new queens. This doesn’t mean they necessarily have to split (and so weaken) their best colonies … it simply means taking a frame of eggs from their best colony and placing it into a well-populated nuc, then ensuring that queen cells are only raised from the introduced frame of eggs. 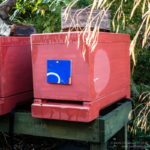 These small changes in beekeeping practice will enable individual beekeepers to make increase without resorting to imported bees and will – over time – improve both their stocks and their beekeeping. Finally, relatively few individual beekeepers keep sufficient numbers of colonies to undertake rational or large scale queen rearing and strain improvement. I certainly don’t. I don’t know how many colonies would be required to start this process off but would suspect it would be at least 50 or perhaps double that number. However, beekeepers with even a handful of colonies can improve their stocks year by year. By routinely selecting from bees with desirable traits for queen rearing and rigorously culling queens with undesirable characteristics – I’ve heard it suggested that the worst 25-30% of stocks should always be requeened – the overall quality of the bees will improve. However, a small group of like-minded beekeepers would easily be managing the 50-100 colonies between them necessary to start more ambitious stock selection. The resources for actually raising queens are relatively limited and could be undertaken in several different apiaries if needed. They would need to agree the quality criteria to judge their colonies against and would need to undertake some joint inspections to decide the desirable lines to keep and the undesirable lines to cull. Groups working together like this already exist, for example several groups work like this in the Native Irish Honey Bee Society. Beekeeping is not difficult. It’s a hugely engrossing pastime in which the best results are achieved by working with the bees, not against them or by forcing them. Quick fixes, such as importing queens early in the season, reduces the requirement for good bee husbandry and the need to be observant and gradually improve your stock. Although I think that imports should be banned to limit the chances of small hive beetle reaching the UK, I think a far greater benefit of such a ban would be the resulting improvements in the quality of UK beekeeping. These improvements are not achieved by taking more exams or qualifications. They are almost all practical skills, readily acquired by observation, good record keeping, talking with your friends and learning from more experienced beekeepers already practising sustainable beekeeping. I would like to see national and local associations more actively promoting the benefits of locally-raised bees. These are the organisations that should be coordinating efforts to become less reliant on imported bees, that should be teaching the practical skills necessary for sustainable beekeeping and that will eventually also benefit from improvements in beekeeping in this country. Readers interested in some of the ideas above should consider attending one of the BIBBA-organized Bee Improvement for All Days this winter. The goal of these workshops is to encourage “beekeepers of all abilities to improve their bees, using simple techniques without the need for specialist equipment“. Michael Palmer gives a great talk on sustainable beekeeping. You can watch his talk (The Sustainable Apiary) at the 2013 National Honey Show on YouTube or perhaps see him in person at the Somerset Beekeepers 2015 Lecture Day on the 21st of February. This entry was posted in Beekeeping, Imports, Training and tagged health, Nucs, queen rearing, sustainable beekeeping, Varroa, winter on December 23, 2014 by David. Time to ban bee imports? The West Sussex Beekeepers Association have proposed the following motion to the BBKA Annual Delegates Meeting (ADM) in January “Following the discovery of Small Hive Beetle, Aethina tumida, (SHB) in Italy in September 2014 this ADM instructs BBKA to urgently seek a ban on the importation of bees and unprocessed bee products into the U.K”. Further details can be found in their newsletter (under the heading Jim’s Jottings, from the illogically named Jim Norfolk, Chairman of the West Sussex BKA). 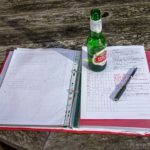 The full proposition from West Sussex BKA, the supporting notes and the response from the BBKA Executive Committee can be found here on the Beekeeping Forum. The Executive Committee of the BBKA does not support the proposition – as summarised in the sentence “At this point in time the Executive does not consider it appropriate to seek or it be possible to achieve a ban on the importation of honey bees and unprocessed honey bee products and does not support the proposition“. There is little justification explaining why the BBKA Executive Committee do not consider it appropriate to seek a ban on imports. As explained in a recent post, the National Bee Unit have conducted a risk assessment (in 2009) which concluded that “The pathway likely to present the greatest risk of introduction [of SHB] was the movement and importation of honey bees”. Please discuss the potential introduction of SHB and how it might be prevented with your own local association. If you feel strongly about it persuade your delegate at the January BBKA ADM to support the motion proposed by the West Sussex BKA. Remember that the UK imports thousands of queens and bees from Europe every year, many are from Italy, but others are from countries like France that also import thousands of queens and bees from Italy. Do you know where the nuc you or enthusiastic beginners purchased in April/May originated from? The precautionary principle is that there “is a social responsibility to protect the [public or environment] from exposure to harm, when scientific investigation has found a plausible risk. These protections can be relaxed only if further scientific findings emerge that provide sound evidence that no harm will result“. There is a plausible risk of SHB entering the UK during the importation of bees. Until evidence is provided to the contrary – presumably by the BBKA and others who do not support a ban on bee imports – the precautionary principle should be applied. The Native Irish Honey Bee Society has “calling for an immediate ban on imports of honey bees on animal health protection grounds“. Malta has already banned imports from Southern Italy. The Local Association Secretaries of the SBA have discussed the threat of SHB where there was considerable support for the following proposition “The SBA urges that all possible measures are taken to prevent the introduction of small hive beetle into the UK. These should include a cessation of trade in live bees from the rest of Europe for 2015 until the true spread of the pest is better known“. The Welsh BKA are discussing the issue shortly. With the exception of the introduction of SHB to Portugal in 2004, no country has managed to eradicate the beetle after it has been introduced. In Portugal the beetle was introduced as larvae with a single shipment of queens (illegally) imported from Texas to a single apiary. All colonies in the apiary were destroyed and the ground was ploughed up and soaked in insecticide. 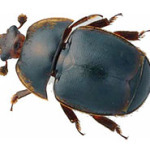 Rather than rely on the contingency plans and sentinel apiaries in the UK to detect the beetle after arrival we should use the age-old doctrine of prevention being better than cure … we should do our best to stop the beetle getting here in the first place. Decreased reliance on imported bees and queens is likely to significantly benefit UK beekeeping in the long run. We may have to alter the way we train beginners, we might have to do a lot more autumn requeening, we might have to improve our integrated pest management, we will have to increase local queen rearing activities … however, none of these are insurmountable problems and all are likely to improve the quality of UK beekeeping. 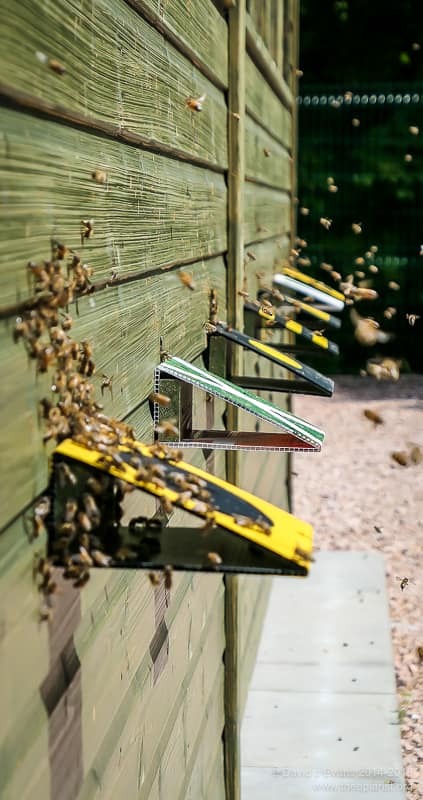 Bees and queens might become more expensive, but only until local association queen and nuc rearing activities have geared up to cope with the additional demand. I would think that any increase would be insignificant if compared to the cost of lost colonies should SHB arrive and become established in the UK. I accept that there might be issues for commercial beekeepers, but am unconvinced that a business model that relies upon cheap imports is sustainable in the long-term. Further details on the biology of Small Hive Beetle can be found in this recent Current Zoology paper (PDF download) written by NBU scientists. This entry was posted in Beekeeping, Imports, Invasives and tagged health, imports, queen rearing, SHB, small hive beetle on November 29, 2014 by David.